If your outdoor interests are piqued by the prospect of hiking a diverse trail system over varied terrain, encountering panoramic vistas, breathing fresh mountain air, splashing in brisk alpine streams, and resting in forests abundant with wildlife, then you have found your outdoor paradise in the mountains and woodlands of Vermont. Yes, Vermont is a wonderful place to hike and explore. Vermont offers miles of woodland walks, hikes and trails in every region of the state. Ask us about VT Hikes or share your Vermont hikes and comments. To feature your VT business, contact us. Safe and happy hiking from Vermont Living Magazine. Hiking in New England is a lot of fun. However, it can also go from fun to dangerous very quickly. Being prepared and knowing what to do in a given situation is very important. Some good general advice is to make sure to plan a route and stick to it. 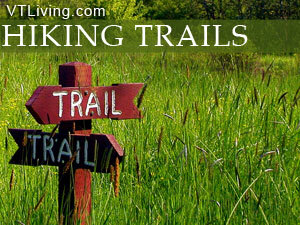 Stay on marked trails and make sure that someone who is not going knows the route and when you should be returning. Do not overexert yourself. Conditions can change in a matter of seconds and you want to be able to handle whatever they may be. 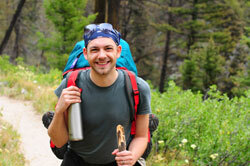 There are a few items which every hiker should have. A whistle can carry farther and last longer than the human voice. It will come in handy if you get lost or separated from the group. A first aid kit is always a good idea, even on short hikes because you never know what may happen. If you do not have a first aid kit, make sure to grab some band aids and antibiotic. Extra clothes, especially sox, often come in very handy. Wear layers, even in the summer. It is important to wear proper footwear such as hiking boots, especially the kind that protects your ankles. A map and compass are good to have, especially if you don’t know the area very well. Food and water are extremely important items when hiking. Make sure to bring way more water than you think you will need. It is better to have extra left over than to run out halfway through the hike. For extended trips bring water purification tablets or boil the water before drinking. When it comes to food there are a few suggestions to keep in mind. First of all remember that it is a hike, so what you bring you carry. Avoid anything that would need a cooler or food that would spoil on the trail. Also keep in mind that the food will be stored in a backpack and so may get smashed while on the trail. Keep your packs as light as possible by bringing foods that are lightweight, such as dehydrated foods or trail mix. Also keep in mind that animals are attracted to the smell of food so if you are camping out overnight elevate the food and most definitely do not keep it in the tent with you. Being able to see an animal firsthand can be very exciting. It may be tempting to get closer to the animal but that would be inviting trouble. Stay at a safe distance and enjoy from afar. Even if an animal appears to be passive or almost friendly, keep in mind that it is in fact wild and could become aggressive very quickly. Never feed a wild animals! This interferes with their natural activity and is also the most common way that animal-related injury or death occurs. It also may cause trouble for future hikers if the animal decides it wants more human food. Stay away from bear cubs and other young animals. They are cute and it is tempting to get closer, but most likely mommy is nearby and if she believes her young is being threatened she will protect it, at your expense. While bears and mountain lions get the most press, the majority of incidents actually involve other wild animals. All animal’s that live in the woods are in fact wild, no matter how cute they are. An animals “fight or flight” response is extremely strong. If you do encounter a potentially dangerous animal try to avoid sudden movements, but make your presence felt and show no fear. The best thing to do is make a lot of noise during your hike. Most animals are afraid and will stay away, thus preventing an encounter. Just keep in mind that most trouble is caused by inappropriate human behavior. Hiking and backpacking in the Green Mountains of Vermont has always been a popular outdoor activity for natives and visitors of all ages. Vermont offers a wide variety of trails – from short, relaxing woodland strolls and moderate hikes, to the extensive and challenging mountain trails that extend deep into the sparsely populated Green Mountain National Forest and adjoin the Appalachian National Scenic Trail. The Long Trail, which follows the Green Mountain Range from the Canadian border to the Massachusetts state line, is world-renowned and offers more than 70 cabins, shelters, and tenting areas along a trail system traversing some of Northern New England’s most spectacular wilderness areas.